Focusing on team translation and the production of multilingual editions, and on the difficulties these techniques created for Renaissance translation theory, this book offers a study of textual practices that were widespread in medieval and Renaissance Europe but have been excluded from translation and literary history. The author shows how collaborative and multilingual translation practices challenge the theoretical reflections of translators, who persistently call for a translation text that offers a single, univocal version and maintains unity of style. In order to explore this tension, Bistué discusses multi-version texts, in both manuscript and print, from a diverse variety of genres: the Scriptures, astrological and astronomical treatises, herbals, goliardic poems, pamphlets, the Greek and Roman classics, humanist grammars, geography treatises, pedagogical dialogs, proverb collections, and romances. Her analyses pay careful attention to both European vernaculars and classical languages, including Arabic, which played a central role in the intense translation activity carried out in medieval Spain. Comparing actual translation texts and strategies with the forceful theoretical demands for unity that characterize the reflections of early modern translators, the author challenges some of the assumptions frequently made in translation and literary analysis. 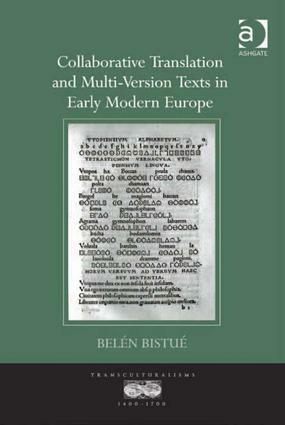 The book contributes to the understanding of early modern discourses and writing practices, including the emerging theoretical discourse on translation and the writing of narrative fiction--both of which, as Bistué shows, define themselves against the models of collaborative translation and multi-version texts. Belén Bistué is Tenured Researcher for CONICET, and Assistant Professor of British and North American Literature at Universidad Nacional de Cuyo, Argentina.